NETWORK UPDATE: FRESH OFF THE BOAT gained 0.1 in final numbers, as did RUDOLPH THE RED-NOSED REINDEER, but the LIMITLESS rerun lost the same. CABLE HIGHLIGHTS: History’s CURSE OF OAK ISLAND gained a tenth to 0.85 and was the highest cable original on Tuesday, with lead-out HUNTING HITLER up 0.03 to 0.51. On Bravo, REAL HOUSEWIVES OF BEVERLY HILLS returned at 0.82 after a 0.52 BELOW DECK lead-in (down 0.02), and GIRLFRIENDS GUIDE TO DIVORCE had a 0.31 Season 2 premiere, the same neighborhood as its Season 1 results. ESPN’s COLLEGE BASKETBALL scored 0.79 after an early game at 0.27. 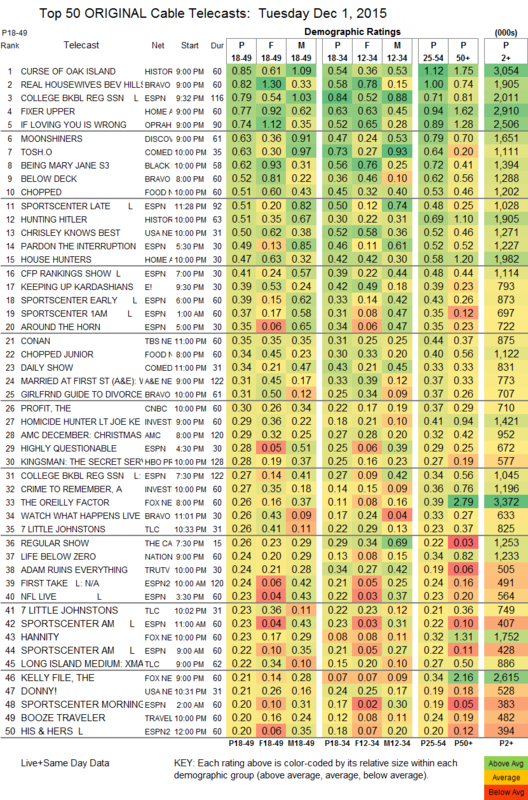 HGTV’s FIXER UPPER arrived at 0.77, followed by 0.47 for HOUSE HUNTERS. OWN’s IF LOVING YOU IS WRONG climbed 0.11 to 0.74. Discovery’s MOONSHINERS was steady at 0.63. On Comedy Central, TOSH.0 jumped 0.14 to 0.63. On BET, BEING MARY JANE ticked up to 0.62. On USA, CHRISLEY KNOWS BEST dropped a tenth to 0.50, and DONNY ticked up to 0.21. The year’s penultimate COLLEGE FOOTBALL PLAYOFFS RANKINGS show on ESPN lost 0.03 to 0.41. A LONG ISLAND MEDIUM XMAS SPECIAL on TLC was at 0.22. 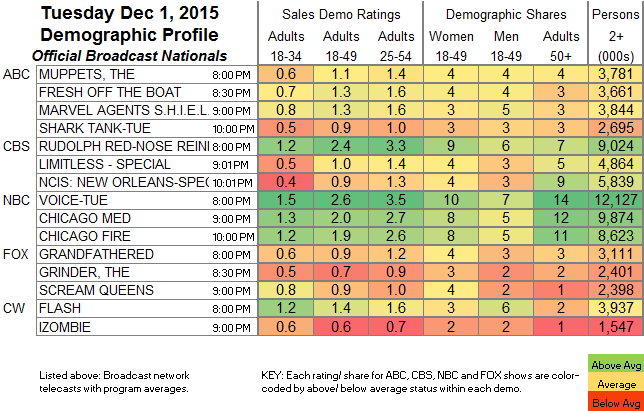 Things are going in the wrong direction for MTV’s FINDING CARTER, down once again, this time by 0.02 to 0.16. WGN’s MANHATTAN rebounded from last week’s low, up 0.03 to 0.04/308K.